In contrast to the Beatlesque vibe of Oasis or the neo-Zep trappings of the Stone Roses, Bush’s sound is surprisingly American for a band which is currently spearheading the newest wave of the British Invasion. Called “England’s Great Grunge Hope,” the band, fronted by singer-songwriter-rhythm guitarist Gavin Rossdale and lead guitarist Nigel Pulsford, took inspiration from a number of U.S. influences – television, the Talking Heads, Alex Chilton, Robbie Robertson, and Earth, Wind & Fire, as well as 90s alternative music pouring out of Seattle. A year ago, they were virtually unknown but hit big in 1996 with their debut album, Sixteen Stone – now beyond quadruple platinum – and ear-catch­ing tunes like “Everything Zen,” “Comedown,” and Glycerine. Glycerine is Gavin Rossdale’s show all the way. He plays the dri­ving rhythm guitar groove which is the heart­beat of the song and provides the tortured vocal performance which made the track an MTV favorite. Live, “Glycerine” is a showcase for Rossdale. He performs it by himself when Bush is in concert, proving that the essence of the piece is in its rhythm guitar. After approximately 10 seconds of eccentric backwards sounds, Glycerine begins with Rossdale’s chunky distorted rhythm part, a catchy four-measure chord riff labeled Rhy. Fig. 1 in the music. Heard throughout the song in the intro, verses and choruses, it is made of power chords and palm-muted bass notes. Rossdale approaches the power chords based on 5th-string roots (C5, D5, and Bb5) two ways. One, he plays them as straight three-note root-5th-root voicings. Two, he plays them as sus2 chords by allowing his index fin­ger to barre the 2nd string and occasionally the 1st string [Fig. 1]. As Nigel Pulsford remarked: “He uses the sus2 chord, one of his favorite voicings, all over the main progres­sion.” The pattern is random and dictated by feel, and is slightly different each time, though based on the general changes of Rhy. Fig. 1. Rhy. Fig. 2, found in the choruses, makes use of frethand-muting technique on the quick 16th-note strums in the pattern. To get a han­dle on this technique, lift your fingers off the strings slightly while holding a chord shape (e.g., C5) and make just enough contact to muffle the strings, creating a percussive, non-pitched effect. Practice timing your hand’s lift-off with the 16th-note strum strokes. Strive to coordinate the two moves. That will ensure a rhythmically smooth performance. 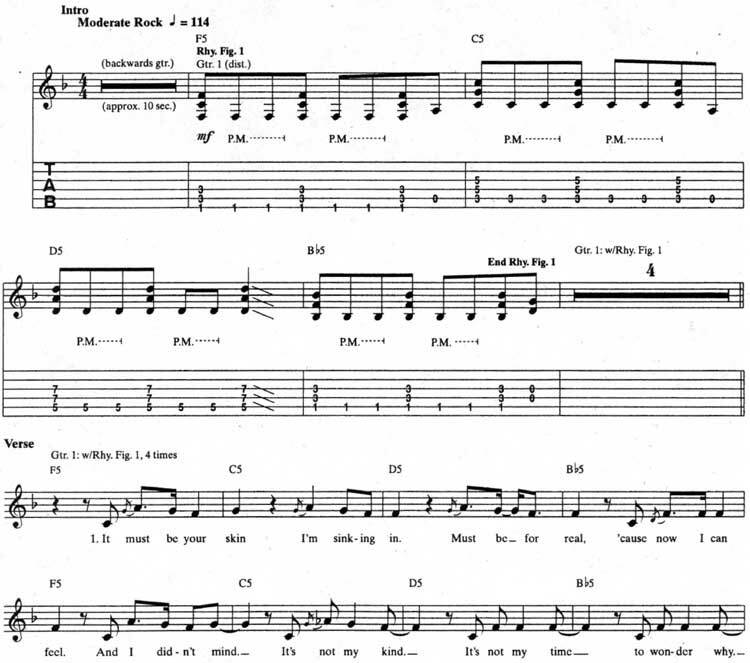 It’s a part of Bush Glycerine guitar tab and sheet music. © 2012 - 2019 TabsClub Powered by TabsClub 42 queries in 0.278 seconds.